Robert Bray Associates has won the 2017 Landscape Institute President’s Award for their work on the Bridget Joyce Square Community Rainpark project. Making the announcement at the LI Awards ceremony at the Brewery in London on November 23, President Merrick Denton-Thompson praised the practice’s ‘exemplary approach to partnership working’. The project is a community-driven scheme that sits between a school and two playgrounds in White City, West London. Previous road and parking facilities at the site made school pick-up and drop-off difficult, and caused crossing hazards for children. In addition, due to its location within the famously capacity-exceeding Counters Creek sewer catchment, the road was highly susceptible to surface water flooding. Local residents and the school head teacher instigated the project. Through an intelligent place-making solution, Robert Bray Associates solved these long-recognised conflicts. The practical solutions they developed, Merrick said, ‘can and should be replicated nationally’. The finished project delivers a safe passage to school for children and a place for parents to meet, as well as a landscape that is resilient to unpredictable climatic events. See the video showcase of all the LI Awards 2017 winners below, or read on to view the full list, including highly commended projects. Merrick’s announcement brought to a close the presentation of the Awards at the Brewery in London. Romy Rawlings CMLI and host Bill Bryson presented over 40 LI Awards to individuals and practices. This included special recognition for Client of the Year (now in its third year) and, for the first time, New Landscape Professional of the Year and Outstanding Contribution Through Volunteering. The LI College of Fellows also nominated one entrant for the Fellows’ Award, which this year acknowledged healthy places. 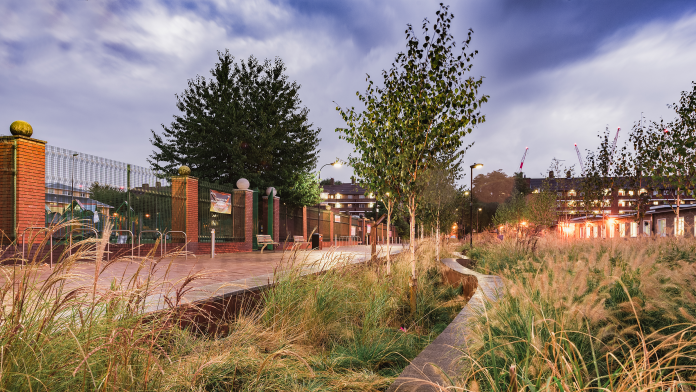 A redesign of the existing street layout of Bridget Joyce Square in West London that addressed local community needs as well as the council’s requirement to retrofit a fully-functioning SuDS scheme. Our judges called the submission ‘an excellent demonstration of “small is beautiful” … The fact that it is community-led is a major attraction of the project’. 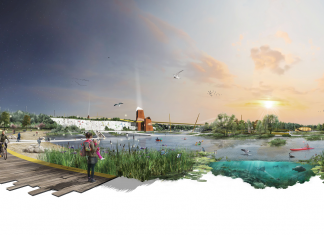 A project to reinvigorate Sunderland’s coastline and, through the use of natural materials and clear civic leadership, deliver an accessible public realm to attract residents, businesses and visitors to the region. A regeneration of Brighton’s North Street, around the Hanningtons Department Store site, which, by rationalising everything from bus-stop placements to new pavements and bicycle parking, has led to impressive results for the city and massively improved the experience of walking down a busy high street. The transformation of the former Bromborough landfill site on the Mersey Wharf into a new 30-hectare community park, tourist hotspot and wildlife haven, enhancing the environment, benefiting the local community and, with the original 40,000-visitor-per-year-target already exceeded, stimulating the economic development of the wider Wirral area. Owners and managers of 25,000 acres of land in Devon, including a major part of the East Devon Pebblebed Heaths Special Area of Conservation, whose forward-thinking Estate Strategy sets out their vision to achieve a sustainable future for the Estate, the local environment and wider community. A campaign celebrating the Glasgow-based firm’s ten years in practice, central to which was a set of limited edition postcards and a cutting-edge social media strategy. Our judges singled out for special praise this novel approach to communication and presentation. A collection of sustainability-based ‘what ifs’ for the 2015 Green Capital of Europe – several of which have already been put into practice in the city – presented as a tactile, fully-recycled. A book emphasising the importance of school grounds in helping children develop a healthy lifestyle and an appreciation of the outdoors, and offering practical suggestions for budget-constrained schools to get the most from their grounds. The story of Fira’s evolution since the company’s inception in 1976 and analysis of the challenges facing landscape professionals now and in the future. A project developed to meet the demand for student housing in the city of Edinburgh, which involved the transformation of unused land in Edinburgh’s Old Town into collegiate accommodation for an additional 900 students. Our judges praised the projects ‘thoughtful design with high-quality detailing’, remarking on how it was ‘extremely well embedded in local context’. The creation of external museum environments that responded to the heritage of Qatar, the culture of each of its distinct Msheireb Museums, and to the Msheireb Mosque. A major refurbishment across multiple locations in the London Borough of Bexley, improving accessibility and making significant landscape repair with an impressive level of community and stakeholder engagement. A sustainable and engaging new attraction for visitors to Hampton Court Palace that takes inspiration from the history of the Palace and its surroundings. A transformation of a neglected park on London’s Euston Road into an accessible and versatile public space. A garden space that allows visitors to explore the many cultural artefacts of Stratford Park in Stroud, Gloucestershire. An ambitious and contemporary project integrating landscape and architecture, extending the Cathedral with an accessible and tranquil community space. The first natural public swimming pool in the UK, with a 40-metre long, chemical-free pond that has space for over 100 bathers, and seasonally changing planting. A multi-sensory play space in North Greenwich conceived for the 2016 London Festival of Architecture to raise awareness for The London Centre of Cerebral Palsy. A project demonstrating how investing in provision and maintenance of urban greenspace pays for itself many times over by reducing both healthcare costs and the associated cost of sickness absence from work; laying a foundation that could readily be emulated by other public authorities responsible for greenspace provision across the nation. The preservation and comprehensive restoration of a significant mid-twentieth century design in Hemel Hempstead, Hertfordshire, which saw the once-disused gardens integrated into the town centre. Our judges were excited to see post-1945 landscape design, which is often overlooked in terms of its heritage, in this category. They praised the HTA team’s thorough research and analysis, describing the project as ‘ground-breaking’. A major restoration of a hilltop park in Durham that helped to address long-standing access and circulation problems, which in recent years had seen the site fall into disrepair. The delicate restoration of a Grade I-listed, seventh-century church that has inspired ongoing community and stakeholder involvement in the site. A precise and meticulous restoration of a Staffordshire-based site that improved both accessibility and quality, despite the complication of its need to remain open to the public for the duration of the works. The latest in a series of 11-yearly reviews that have, since 1972, monitored landscape change in seven key rural areas. Noting the publication’s contribution to the profession and its potential application beyond the regions of focus, our judges unanimously declared this study the overall category winner. An analysis of and data on 199 parks and open spaces across the North London borough of Barnet, undertaken to demonstrate the health benefits from investment in greenspace; an example of valuable work that enables landscape professionals to support local authorities in justifying expenditure on parks and open spaces. An annual forum and publication that involves practitioners in Scotland in an important, forward-thinking dialogue on green infrastructure, and plays an important part in the development of professional practice in Scotland and beyond. The reclamation of a derelict clay pit in North Wales for beneficial uses including the building of 300 houses, the development of a nature reserve and, the creation of a public open space containing biodiverse habitats of educational value. A highly convincing strategy that has transformed the NUS campus into a vibrant ecological landscape, restoring native biodiversity in the natural tropical ecosystem that rapid urbanisation and development in Singapore has threatened. An examination of strategies for eliminating the risk of dam failure within the two main chains of ponds on Hampstead Heath that ensured the development of a sustainable solution through planning, design, implementation and management, while also securing biodiversity opportunities in the surrounding environment. An expansive response to a project brief to enhance the heavily polluted Ulsoor Lake site in Bangalore, India, including the creation of a series of parks, terraces and amenities, which has even raised the possibility of returning to a potable supply for the water-starved city. Our judges were impressed that the project team had rejected the initial brief, widening the scope to encompass a holistic solution to the problem of pollution. A 50-home residential scheme that forms a new edge to the village of Kings Worthy in Hampshire, boasting an integrated approach to water management, ecology and vegetation infrastructure. A map-based masterplan for the North Kyle Forest in Ayrshire, Scotland, including ideas for social, environmental, cultural and economic projects within the area. The project team involved local residents, agencies and other stakeholder groups in a comprehensive consultation process, ensuring a clear understanding of local issues. A document that directs professionals in how to develop an integrated landscape design along the HS2 high-speed railway route that will link London, Birmingham, the East Midlands, Leeds and Manchester, which our judges said ‘has the potential to be truly groundbreaking’. An in-depth analysis and detailed profile of twenty-one landscape and nine seascape areas, exemplifying the value of a fully linked character and sensitivity study spanning urban, land and sea. An important and thoroughly researched analysis of landscape architecture’s role within modern migration which, using Calais as a case study, proposes a new typology of landscape-led temporary settlements for refugees. An insightful analysis of the Cliffe Marshes area of the Thames Estuary, which considers whether the abandoned former military factory should be thought of as a heritage site, or be a place full of redevelopment potential. A combination of experiential fieldwork with evidence-based research to create what our judges called ‘a beautifully presented portfolio … unmatched in its demonstration of considered and appropriate landscape responses’. A collection of work focusing on landscape within the urban realm and designing with the pressures of modern urban infrastructure, analysing how design can influence quality of life. A masterplan setting out a 40-year development framework for a new low-carbon city district in Muscat, Oman, realising Irfan’s ambition to be a catalyst for change in the country while providing a sustainable development model for future generations. A masterplan for a 100-hectare site along a defunct railway line in Singapore that turned the 24-kilometre track into a celebration of the ecology and culture of the country. Our judges called it ‘a truly inspiring project … it provides a transformative catalyst for development on an extensive scale’.